This page describes how to connect Bitbucket Server to a Microsoft SQL Server database. 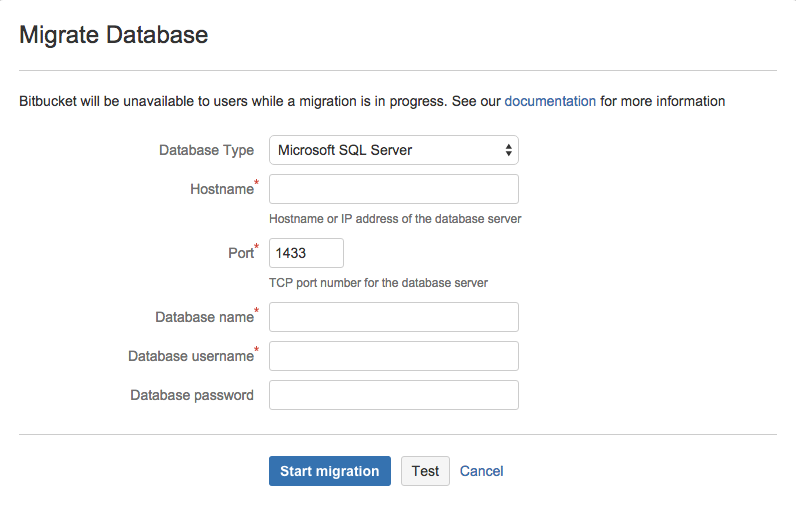 You can connect Bitbucket to a SQL server either at install time using the Setup Wizard, or later using the Using the Database Migration Wizard. These instructions assume that you already have SQL Server installed and running. Install SQL Server where it is accessible to Bitbucket Server. Create a database and user on the SQL Server instance for Bitbucket Server to use. Install Bitbucket Server on Windows, or on Linux or Mac. See the Bitbucket Server installation guide. See Supported platforms for the versions of SQL Server supported by Bitbucket Server. Create a database e.g. bitbucket. Remember this database name for the connection step below. Set the collation type This should be case-sensitive, for example, 'SQL_Latin1_General_CP1_CS_AS' (CS = Case Sensitive). Set the isolation level Configure the database to use the isolation level, Read Committed with Row Versioning. Create a database user e.g. bitbucketuser. This database user should not be the database owner, but should be in the db_owner role. It needs to be in this role during setup and at all points when Bitbucket Server is running due to the way Bitbucket Server interacts with the database. See SQL Server Startup Errors. Remember this database user name for the connection step below. Set database user permissions The Bitbucket Server database user has permission to connect to the database, and to create and drop tables, indexes and other constraints, and insert and delete data, in the newly-created database. Enable TCP/IP Ensure that TCP/IP is enabled on SQL Server and that SQL Server is listening on the correct port (which is 1433 for a default SQL Server installation). Remember this port number for the connection step below. Ensure that SQL Server is operating in the appropriate authentication mode. By default, SQL Server operates in 'Windows Authentication Mode'. However, if your user is not associated with a trusted SQL connection, 'Microsoft SQL Server, Error: 18452' is received during Bitbucket Server startup, and you will need to change the authentication mode to 'Mixed Authentication Mode'. Navigate to Tools > Options > Query Execution > SQL Server > Advanced. Ensure that the SET NOCOUNT option is cleared. Now, go to the Server > Properties > Connections > Default Connections properties box and clear the no count option. Note that Bitbucket Server will generally require about 25–30 connections to the database. Note also that Bitbucket Server requires the database to keep idle connections alive for at least 10 minutes. If the database is configured with less than a 10 minute connection timeout, there will be seemingly random connection errors. This creates an empty SQL Server database with the name bitbucket, and a user that can log in from the host that Bitbucket Server is running on who has full access to the newly created database. In particular, the user should be allowed to create and drop tables, indexes and other constraints. when you wish to migrate to SQL Server, either from the embedded database or from another external database. Select SQL Server for Database Type. ポート The TCP port with which Bitbucket Server can connect to the database server. The default value of 1433 is the default port that SQL Server runs against. You can change that if you know the port that your SQL Server instance is using. Database username The username that Bitbucket Server should use to access the database. Database password The password that Bitbucket Server should use to access the database. If you have a named instance on your server, you will need to manually edit the bitbucket.properties file as described on the Connecting to named instances in SQL Server from Bitbucket Server Knowledge Base article. Windows authentication is only available for Bitbucket Server instances running on Windows. It cannot be used on Linux because Microsoft does not provide shared objects for it. You will either need to run Bitbucket Server on Windows, allowing you to use Windows security, or you will need to enable mixed-mode authentication for SQL Server if you are running Bitbucket Server on Linux. Unfortunately, there are no other options at this time. Integrated authentication uses a native DLL to access the credentials of the logged-in user to authenticate with SQL Server. The native DLLs for both 32- and 64-bit systems are included in the distribution; there is no need to download the entire package from Microsoft. Based on the JVM being used to run Bitbucket Server, rename either the x64 or x86 DLL to sqljdbc_auth.dll in lib/native. Note that running on Windows x64 does not require the use of the x64 DLL; you should only use the x64 DLL if you are also using a 64-bit JVM. In _start-webapp.bat, a JVM_LIBRARY_PATH variable has already been defined. Simply remove the leading rem . Note that if you are putting the native DLL in an alternative location, you may need to change the value to point to your own path. The value of the JVM_LIBRARY_PATH variable will automatically be included in the command line when Tomcat is run using start-bitbucket.bat. Edit the %BITBUCKET_HOME%\shared\bitbucket.properties file to include ;integratedSecurity=true in the jdbc.url line. Note that jdbc.user and jdbc.password will no longer be used to supply credentials but they must still be defined – Bitbucket Server will fail to start if these properties are removed. It is also possible to configure integrated authentication over Kerberos, rather than using the native DLLs. Details for that are included in the JDBC documentation. This section is only relevant to some distributions of Bitbucket Server, for example if you are running Bitbucket Server via the Atlassian Plugin SDK, or have built Bitbucket Server from source. If the SQL Server JDBC driver is not bundled with Bitbucket Server, you will need to download and install the driver yourself. Download the appropriate JDBC driver from the Microsoft download site. Install the driver file to your <Bitbucket home directory> /lib directory (for Bitbucket Server 2.1 or later). Stop, then restart, Bitbucket Server. See Starting and stopping Bitbucket Server. If Bitbucket Server was configured to use Microsoft SQL Server by manually entering a JDBC URL, please refer to this guide.